sales or cost of goods sold behaves over time. 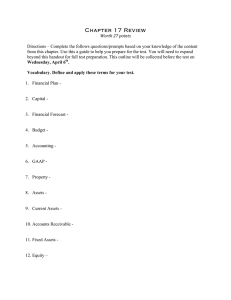 sheet, all items are typically stated as a percentage of total assets. to get some idea of whether a situation is improving, remaining the same, or deteriorating. 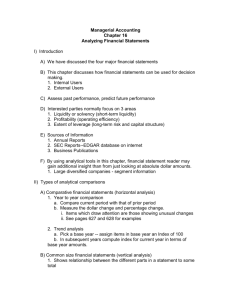 company to another or to industry averages using common-size financial statements. of 20 would be selling for $80 per share. have a low dividend payout ratio. negative and the stockholders lose. payments might be very difficult to meet. stock often exceeds the book value per share. market value exceeds book value because investors anticipate future earnings growth. © The McGraw-Hill Companies, Inc., 2008. All rights reserved. as a percentage of sales has increased and gross margin has decreased. decreased from 14.6% of sales last year to 13.6% of sales this year. This probably is a result of the company’s efforts to reduce administrative expenses during the year. 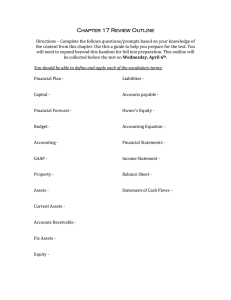 Beginning balance, stockholders’ equity (a)..
strong gain in Year 4.
collecting receivables. This is a matter for management to investigate further. bonds payable, which have an after-tax interest cost of only 7%. 10% interest rate × (1 – 0.30) = 7% after-tax cost. g. Net income before interest and taxes (a) . Preferred stock, $50 par, 8% . Note: Columns may not total down due to rounding. 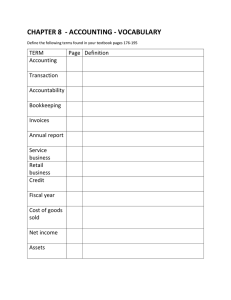 Selling and administrative expenses ..
company to pay its bills as they come due. aggressive in expanding its sales. Average number of common shares (b) . result of already completed transactions. *1/2($2,150,000 + $1,950,000); 1/2($1,950,000 + $1,786,000). 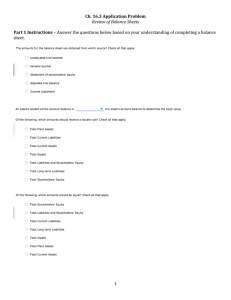 the accounts payable, which may bear no interest cost. (10.4%) compares favorably with that of the industry. making it an excellent investment. 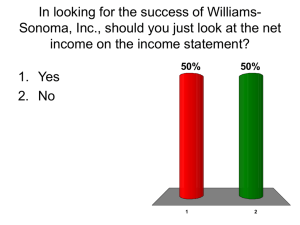 Net income remaining for common (a) ..
(4.9%) is less than the return on total assets (5.1%). share of stock for the typical company in the industry. 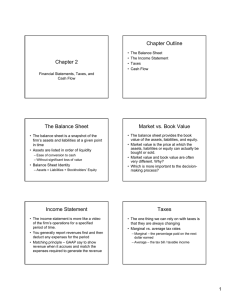 whereas book value is a result of already completed transactions. over more units. However, the gross margin percentage has declined. $1,000,000 loan is granted, the ratio will rise further to 1.09. In our opinion, what the company needs is more equity—not more debt. encouraged to issue more common stock. Preferred stock, 8%, $30 par value . financing required to build inventories was supplied by short-term creditors, as evidenced by the increase in current liabilities. because of the existence of fixed expenses. 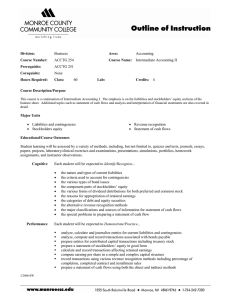 in retained earnings, which is part of stockholders’ equity. asset is exchanged for another. turnover, which in turn decreases the average collection period. ratio, so long as the current assets exceed the current liabilities. price of the company’s stock. up, then the yield will decrease. therefore the return on total assets would increase. of cost of goods sold. than the rate paid on the bonds, leverage is positive, increasing the return to the common stockholders. therefore have no effect on this ratio. A decrease in net income would mean less income available to cover interest payments. Therefore, the timesinterest-earned ratio would decrease. for Bad Debts will have no effect on total current assets. For this reason, the current ratio will remain unchanged. ratio of quick assets to current liabilities will decrease. up, then the price-earnings ratio will increase. three-year period are unchanged, but the dividend yield is going up. Therefore, the market price per share of stock must be decreasing. earnings per share must be increasing. is going down [see part (a) above], and the earnings per share are going up [see part (b) above], then the price-earnings ratio must be decreasing. leverage was positive because in those years the return on common equity exceeded the return on total assets employed. which bills cannot be paid. f. Customers are paying their bills more slowly in Year 3 than in Year 1. This is evidenced by the decline in accounts receivable turnover. in turnover and in an increase in total sales. the average level of inventory must be increasing as well in order to service the larger volume of sales. The company would not qualify for the loan because both its current ratio and its acid-test ratio are too low. would be unaffected. Inventory is considered a current asset for purposes of computing the current ratio, but is not included in the numerator when computing the acid-test ratio. in both the current ratio and in the acid-test ratio. b. Net income before taxes = $315,000 – $45,000 = $270,000. c. Income taxes = $270,000 × 40% tax rate = $108,000. d. Net income = $270,000 – $108,000 = $162,000. have been $180,000. The beginning balance was $160,000, so the ending balance must have been $200,000. Selling and administrative expenses = $900,000– $315,000 = $585,000. 10%, so the bonds payable must total $450,000. 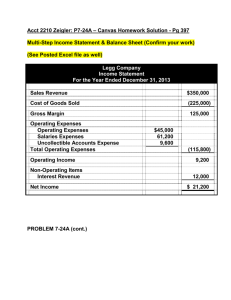 l. Total liabilities = $250,000 + $450,000 = $700,000. 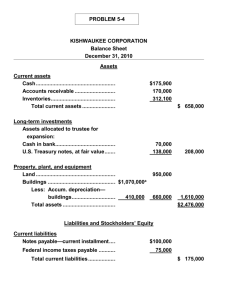 total of the liabilities and the stockholders’ equity). no unexpected drops in sales or earnings. This type of consistency is valued by investors. potentially distort conclusions about operational performance. *Provision for income taxes ($1,146) divided by earnings before income taxes ($3,031) = 37.8%. the portion of Target’s total sales that are credit sales. Earnings before interest expense and income taxes ..
Wal*Mart which is renowned for its supply chain management practices. Target’s slightly higher price-earnings ratio suggests that investors believe Target has modestly stronger earnings growth prospects than WalMart.